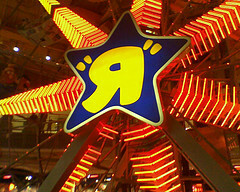 On February 15, 2008, toy giant Toys “R” Us promised consumers it would phase out toys with dangerous chemicals. All manufacturers have been notified that by the end of 2008 juvenile products sold in any Toys”R”Us or Babies”R”Us store in the United States must be produced without the addition of phthalates that have raised concerns about infant safety. Additionally, as we move closer to our goal of offering PVC-free products, we have already begun replacing PVC and phthalates in juvenile products manufactured exclusively for Toys”R”Us, Inc. Unfortunately, they have not kept their promise. Juvenile products shipped to Toys“R”Us, Inc. must be produced without the addition of phthalates which have raised concerns about infant safety. Recognizing that some of our customers are seeking PVC-free products for infants, since 2007 the company has taken steps to eliminate or reduce PVC in juvenile products manufactured exclusively for Toys“R”Us, Inc. Specific categories, such as vinyl bibs, have been removed entirely from store inventories and replaced with PVC-free merchandise lines. In addition, PVC reductions have been made in certain infant bath, feeding and teething lines produced solely for the company. Toys“R”Us, Inc. continues to look for ways to reduce or replace PVC in its exclusive product offerings for infants. Unfortunately, Toys “R” Us’ safety policies don’t hold up to independent testing. This rigorous testing proved one thing: Despite promises to reduce toxic chemicals in toys, Toys “R” Us continues to sell products made out of PVC, the “poison plastic,” without adequate cautionary labeling for parents. As such, we have made it very clear to manufacturers that we need not wait for the finalization of the much-needed tighter federal standards that are currently pending in welcome legislation before the U.S. Congress. Our customers trust and expect that we will always do the right thing when it comes to the safety of children, and we take this responsibility very seriously. Toys that tested positive for PVC include Barbie, “Toys Story 3” Woody and Buzz Lightyear figures, Disney Princess Royal Giggles doll, Zhu Zhu Pets Hamster Hangout, Nickelodeon’s Dora the Explorer and Diego figures, Sesame Street Elmo Faucet Cover, Club Penguin figurines, Imaginext toddler action figures and many others, from dolls and balls, to baby bath time toys and products, and even My Name Sippy Cups. PVC was also found in toys whose brands are owned by Geoffrey LLC, a subsidiary of Toys “R” Us, including You and Me dolls, Especially for Baby, and Sizzlin’ Time items. Perhaps most upsetting is that the majority of the toys that tested positive for these chemicals are designed for children under 36 months. I do not shop at Toys “R” Us. One does not exist within 100 miles of my home since the store closures a few years ago. What saddens me the most about reports like this is that the average person shopping at large toy retailers are probably not reading these reports about toy safety. Consumers read the company’s assurances on toy safety and believe them. I do the same thing for the companies I trust. this is typical Toys R US and/or Babies R Us. My personal dealings with the company have been about the same. They really do not care about what they sell, whether there is poison in poroducts or if they are choking hazards. As long as they make a PROFIT that is what they truly care about. I run a childproofing company in Arizona and I can assure you that if a product is bad we pull it immediately. Shop at a smaller company who CARES about their customers.